These durable black plastic tubes with a 3" (8 cm) inside diameter have a unique design that allows them to accommodate materials of varying lengths. To extend, simply twist the tube and friction-lock it at the desired length. The secure twist-off screw cap is attached to an adjustable, removable shoulder strap. 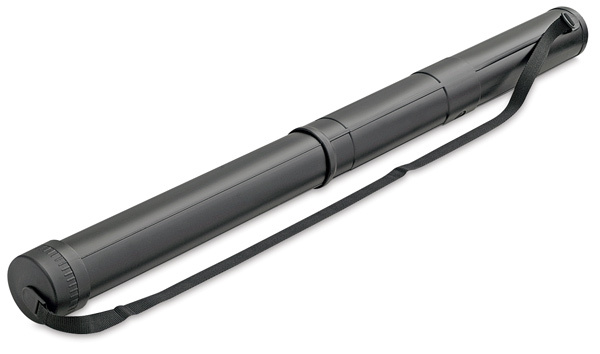 Because Alvin Twist-Lock Telescoping Storage Tubes are water-resistant, they are ideal for transporting and protecting drawings, charts, maps, blueprints, posters, and more from the elements. Storage Tube, 47–62" long — This version of the Twist-Lock Telescoping Storage Tube locks in place at ¾" increments and features a translucent cap for easy viewing and labeling of the contents.